For-profit child care—large corporate-type, regional chain and single-owner operations—has grown rapidly in Canada since 2006. Before 2004, the share of total spaces operated as for-profit entities had been dropping steadily, down to 20 per cent of total spaces by 2004. 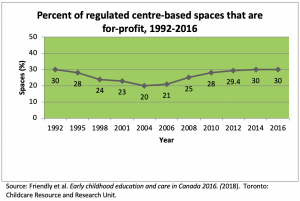 After 2006, however, funding for public child care and expansion of spaces stagnated, and the for-profit child care sector across Canada ballooned, increasing its “market share” by 10 per cent. It represented 30 per cent of regulated spaces in 2016. Provinces/territories show substantial differences in the prevalence of for-profit child care, from almost no for-profit provision to almost 80 per cent of full day spaces operating on a for-profit basis. There are also differences in how for-profit child care is treated for funding purposes. Saskatchewan is the sole province providing no public funds to for-profit child care, and there is almost none in the province. In most other jurisdictions, funding in the form of fee subsidies, operational and sometimes capital funds is available to both the for-profit and non-profit sectors. In the last decade, there have been substantial differences in expansion rates of for-profit child care among provinces/territories with several showing much or most of their expansion in the for-profit sector, and others showing very little. Quebec and Manitoba both treat the two sectors differently. In Quebec, many garderies (for-profit centres) receive Quebec’s considerable operational funding but somewhat less than non-profits, while Manitoba does not give its operational “unit funding” to for-profits. Quebec has, however, encouraged expansion of unfunded for-profit centres by reimbursing parent-users using a tax credit to cover up to 90% of their child care cost, depending on income. Since this tax credit became available, for-profit child care has grown to represent more than 50 per cent of centre-based child care for 0-4 year olds. Historically, funding for capital and start-up was unavailable to for-profit child care in Ontario, although other funds were available. In recent years, a number of restrictions on funding to for-profits had been set by the Ontario government. However, in 2018, the new Ontario Conservative government removed a number of these restrictions. Many Ontario municipalities (16 of 47 in 2018), which play a significant role in child care, have placed their own restrictions on public funding to for-profits. Historically, Canada has had very little corporately-owned or corporate-type child care, compared to other countries with marketized child care, such as Australia, the UK, the US and the Netherlands. Today, however, chains are on the rise in Canada and several large corporate-type child care operators have taken hold. Stock market-traded Bright Path (formerly Edleun) operates 84 centres in Alberta, Ontario and BC. In July 2017, Bright Path was sold to the UK’s biggest child care chain, Busy Bees. Kids & Company, a private (non-stock market-traded) firm, will operate 100 Canadian centres in six provinces and nine US centres in 2019. As in the other market-child care countries, it is not uncommon for large corporate-type operators to buy up small existing regional chains as a means of expansion. As well, “big-box” child care is typically backed by hefty private investment funds that allow rapid expansion. This has been the pattern in other countries and appears to be the case in Canada as well, demonstrated in the last few years by substantial private investment in the two biggest “big-box” firms.